Owner nice lady bring the key, parking card. Parking was aprox 10-15 min to walk, but OK. I big room, nice wiev, good location, even 2nd flour in biulding OK. Nice stay, but for shorte time. Kitchen small size, but nice equiped with all you need to serve the food. Very close the city center, supermarket Dirk 3 minutes to walk. Wunderschön gelegenes Appartement. Direkt am Strand und der Promenade. Traumhafter Ausblick und Balkon. Weniger als 1 min. Zum Strand und zur Innenstadt. Schlüsselübergabe völlig problemlos. Kostenloser Parkplatz. Super zentral! Genialer Blick auf spektakuläre Sonnenuntergänge. Sehr gemütlich und zweckmäßig eingerichtet. Genialer Sonnenbalkon von Mittags bis zum Sonnenuntergang. 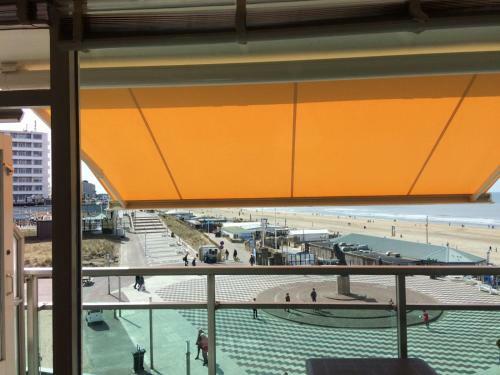 de locatie je kijkt over de boulevard en het strand . Het is een prachtige kamer, en een schitterend uitzicht op strand en de zee. een toploatie. Alles spitzenmäßig. Danke Elli. Es war wunderschön. Wir kommen gerne wieder. Es war alles super. Die Lage könnte nicht besser sein und der Ausblick ist in live noch toller als auf den Fotos. Wir waren nicht zum letzten Mal hier! Das Studio an sich perfekt, der Ausblick traumhaft. Die Einrichtung ist auch sehr geschmackvoll. Die Vermieterin ist sehr nett und zuvorkommend, ich konnte schon direkt bei Anreise um 10.30 Uhr ins Studio. Evtl. waren die Vormieter schon früh oder tags vorher abgereist. Der Parkplatz war inkl. entgegen anderer Kommentar hier auf der Seite nicht 20 Minuten zu Fuß entfernt. Ich bin ca 5 Minuten gelaufen, aber auch nicht eingeschränkt unterwegs. Vielleicht war ich deshalb schneller ;-) Die Betten waren perfekt, alles in allem ein gelungener Aufenthalt. Lock in a great price for Strandstudio – rated 9.2 by recent guests! 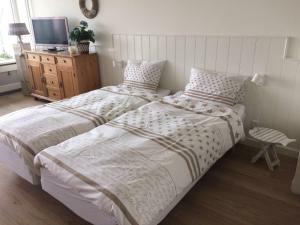 One of our top picks in Zandvoort.Located a few steps from Holland Casino Zandvoort and a 7-minute walk from Circus Zandvoort, Strandstudio offers accommodations with a kitchen in Zandvoort. The property features sea views, plus is 2,100 feet from Zandvoorts Museum. Including 1 bedroom and 1 bathroom with a shower, this apartment has a satellite flat-screen TV. Circuit Zandvoort is a 20-minute walk from Strandstudio. The nearest airport is Schiphol Airport, 16 miles from the property. This property also has one of the top-rated locations in Zandvoort! Guests are happier about it compared to other properties in the area. 뀐 Located in the top-rated area in Zandvoort, this property has an excellent location score of 9.8! When would you like to stay at Strandstudio? This apartment features a electric kettle, balcony and seating area. House Rules Strandstudio takes special requests – add in the next step! Please inform Strandstudio of your expected arrival time in advance. You can use the Special Requests box when booking, or contact the property directly using the contact details in your confirmation. In Bathroom no single electric connection for hair dryer. In Kitchen might be the oven to bake some pizzza etc. by longer stay.